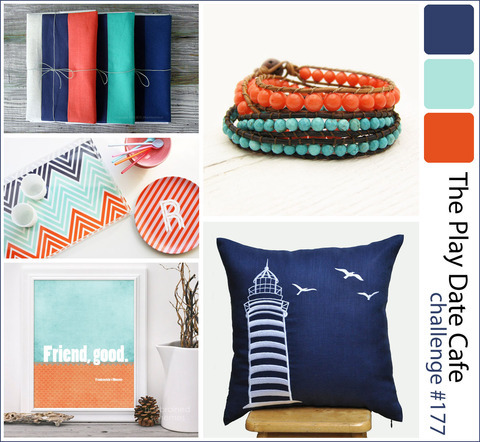 Welcome to this week's color story from The Play Date Cafe. Our colors are Midnight, Aqua and Terracotta. For this card I used papers from my March Studio Calico Card Kit. The chipboard sentiment was also in the kit. The wood arrow is from Freckled Fawn and I cut some midnight blue paper in the same shape to put behind it so it would show up more. The ticket die is from Hero Arts and the twine is from Whisker Graphics. These are really fun colors and I think you're going to love making your project this week. Can't wait to see what you come up with!! Love, love, love your card!! Totally awesome!! I don't see your posts popping up in my blogger reading list anymore...Think there's something wrong...must check it out!! awesome take on the challenge..love that big arrow.. great design..
Great use of those fab papers and the big arrow is perfect! Perfect! I love the wood shapes. Such a cool, graphic feel!